As part of a renewed agency of record partnership with one of the Okanagan's busiest hotels, Kelowna marketing agency Twin Creek Media is delivering a responsive, stunning new website and a cutting edge social media campaign. Twin Creek Media redesigns the Best Western Kelowna Hotel's website and integrates new online marketing strategies to boost ranking on Google. Today, over 25 per cent of people are visiting the site (and booking rooms) on their phone, and when they go to the website on a PC, they want to see simplicity—captivating photos, complimented by clean, wide open spaces. Twin Creek Media didn’t have much time to celebrate renewing an agency of record partnership with BEST WESTERN PLUS Kelowna Hotel & Suites before getting back to work. 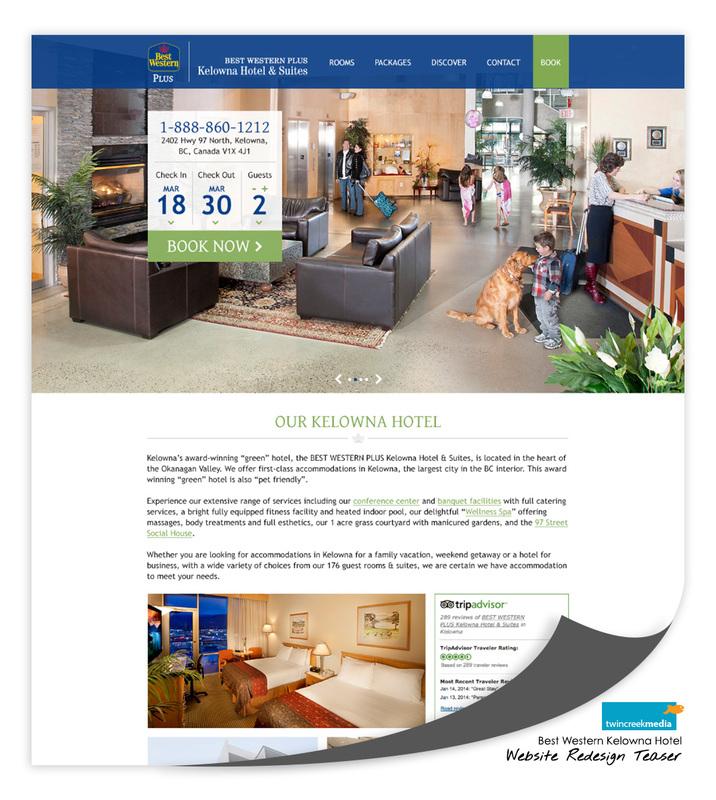 The Kelowna marketing agency had to re-imagine the hotel’s website, and designers had three goals: The site needed to suit 100+ screen sizes, use social media even better, and be as eye-catching as a glossy travel magazine. “Trends have changed over the last five years,” says Twin Creek Media partner and CEO James Shaw. “Today, over 25 per cent of people are visiting the site (and booking rooms) on their phone, and when they go to the website on a PC, they want to see simplicity—captivating photos, complimented by clean, wide open spaces,” says Shaw. The new website for BEST WESTERN PLUS Kelowna Hotel & Suites, launching in March, will feature twice the photos, a responsive design that automatically fits any mobile, tablet or PC device, and a digital marketing strategy that will keep the site on Google’s first page. The hotel’s site was only on page four in 2010, when Twin Creek Media first redesigned the hotel’s site and took over its digital marketing. Within six months, the site was ranking at the top of Google searches for ‘Kelowna hotels,’ and web traffic had doubled. Combined with a better conversion rate, the new site was generating 3-4x more revenue. Along with two partners, the Kelowna web design company acts as a full-service digital marketing department to boost site traffic and sales for clients across western Canada. A hotel’s website, he says, is unique, with visitors often using their phones to make valuable, emotional decisions based on first impressions and ease of use. “When you design a tailored experience for someone on their phone, the results are that much better. Everything just works, and no one notices… which is exactly the point,” says Shaw. Using visitor data gathered in Google Analytics and other systems, Twin Creek Media can focus their attention in the areas where people spend the most time: looking at room photos, checking rates, and reading about packages and promotions. Tying everything together through an integrated marketing strategy is the real magic. Both online and offline, the message is consistent, with each channel complimenting the others. The guests themselves are respected for the influence they have; feedback and public reviews are encouraged, not feared. Social media networks—blog posts, Pinterest, YouTube, Facebook—are always playing a bigger role in how people find out and feel about hotels. Brand awareness, search engine optimization, web traffic generation, site conversion, social media, and analytics… marketing hotels has never been so scientific. Shaw laughs in agreement, “Our agency’s tagline is ‘Art + Science + Passion’”.